Organizing a cluttered office space can be a tall task, but it's much less daunting with the right storage equipment. Anduin Havens, art director for "The Martha Stewart Show," shares innovative storage solutions for any home office -- whether you're buying or DIYing. Don't let the name fool you. Our new Martha Stewart Living closet organization system from The Home Depot lets you design storage structures for any type of space, from entryways to home workstations. The system consists of shelves, hanging bars, and whatever additional components you choose to fully customize your office space. Our online storage planner helps you choose options for shelving, file cabinets, dry-erase surfaces, and other efficiency essentials. Design your own storage system at marthastewartclosets.com. 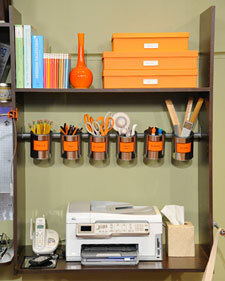 If you're looking to maximize desk space -- and you're feeling crafty -- try this paint-can storage apparatus. 1. Drill two sets of two holes, one above the other, into back of paint can. 2. Feed a zip tie through each set of holes from top to bottom. 3. Print paint can labels on colorful paper and cut out each label. Attach a label to can with permanent adhesive tape roller. 4. Place a small piece of nonskid drawer liner on rod where can will be attached; attach can over liner by pulling zip ties tight around rod. Snip ends of zip tie. Permanent adhesive tape roller from Martha Stewart Crafts; all other tools and materials available at The Home Depot.